Gaspar: What do you see? Look outside. Skakel: I hear dogs barking. Skakel: I think it was ________(inaudible)________. Gaspar: Dogs are barking. You look outside. What do you see? Why were they barking? Skakel: Near the pool. Behind the pool. Skakel: I went to the window. I didn't see anybody. The dogs were barking. Gaspar: What was near the pool or behind the pool? Skakel: Somebody must've been walking. Gaspar: How do you know that? Skakel: Whenever somebody came through any of the doors, the dogs would bark like crazy, especially the Ix's dog. Gaspar: Can you see them? Anybody whose walking? 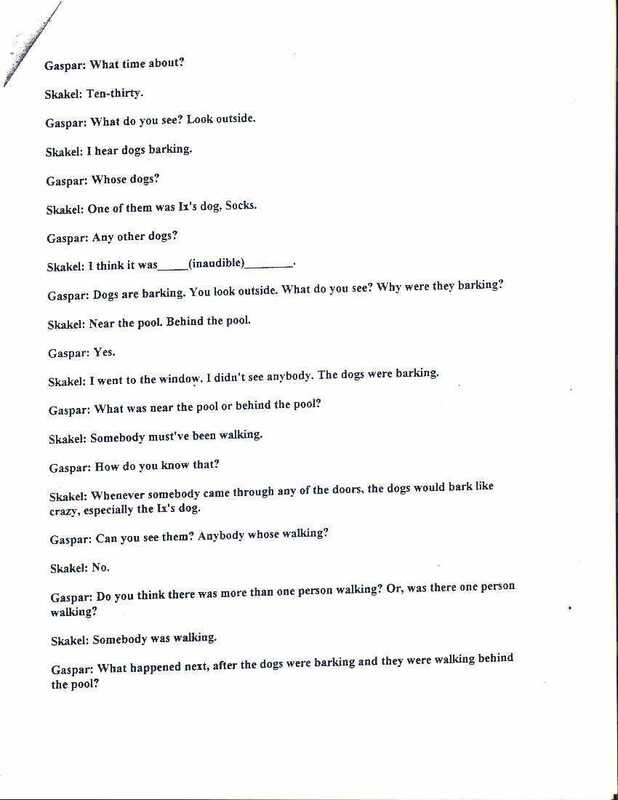 Gaspar: Do you think there was more than one person walking? Or, was there one person walking? Gaspar: What happened next, after the dogs were barking and they were walking behind the pool? Powered By CAMPy Skakel "http://imageshack.us/a/img440/7719/tsprej3.jpg"